Just sharing a quick video of 2 of our autons used at MSC. The 2 hatch side cargo was done while there in between matches one day so we’d have it for elims. The 2 hatch rocket has been used throughout our season. We like our programmers…just a little. Can you explain your hatch manipulator? I have seen a couple of these and I have to say they are REALLY good. It is an active hatch mechanism driven by a motor (here it is a 775 pro). Here is a picture of ours. I believe it uses 3in compliant wheels. It is also, commonly referred to as the “PP intake”. Our opens and closes to be used for both game pieces. Plates are laser cut from Lexan. Wheels are 3" flex wheels from VEX. 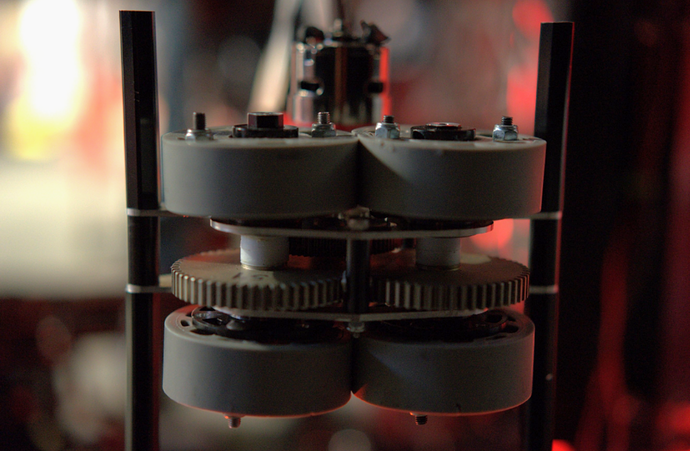 We use pistons to make it tilt up (to stay inside frame perimeter) and down as well as open/close. Key is compression. Have to get the right amount to not have the panels drop. In our reveal video - https://youtu.be/Kwc_tQScjko you can see how we use it for cargo as well. Getting two just by driving is awesome! Congrats on MSC by the way. Those final matches were a lot of fun to watch! Thank you, I love how you can just run into the loading station and boom, you have a hatch. thanks! i was one of the drive team members and it was pretty stressful seeing the screen pop up with two ties shout out to goon squad and lightning though, they basically won us that! It was great pairing with you guys for eliminations at States. So close to winning our division. Best of luck in Detroit! Awesome playing with you guys!